Some people go through food phases. When my friend Lauren was little, she decided she liked cucumbers…until her parents gave her so many that, to this day, cucumbers are definitely not her first choice. I have pizza-and-wine-for-dinner phases that can last a week, but then I won’t have another slice for a month or more. When I started eating egg whites, I thought it would be another food phase…but I’ve had them almost every day for about three years now. I remember dying Easter eggs with my mom in preschool. It might have been the first time I tried a hard-boiled egg. She told me to take a big bite of the whole egg, because the yellow part in the middle is the best. Umm…not so much for me, even at age four. I keep trying them, but egg yolks are just not something that I like. I’ve eaten regular scrambled eggs twice in my adult life, to be polite at breakfast gatherings (thank goodness they were covered in cheese both times!!). Since we’re going on three years of egg whites here, I have found lots of ways to keep it interesting. Egg whites and cheese on an English muffin, egg white breakfast burritos, egg white omelets of many kinds, egg whites with different cheeses…the list goes on. 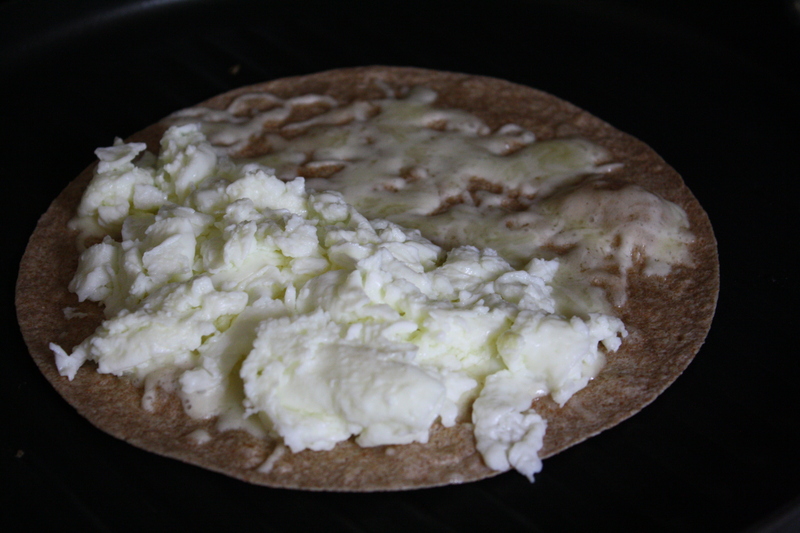 Recently inspired by this post at Dine and Dish, which I discovered on The Kitchn, I created a very tasty eggadilla…featuring egg whites, of course. I think avocado, scallions, and/or tomatoes would be a great addition to this meal! Heat non-stick pan to medium-high and coat with oil (or cooking spray). Heat grill pan over medium-high heat. 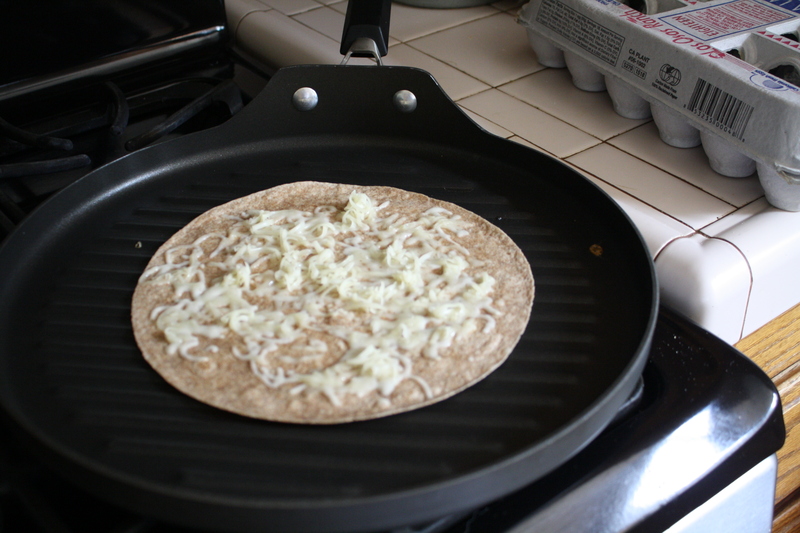 Place tortilla on grill pan and sprinkle with cheese. Add eggs to other pan and scramble. When cheese is melted and eggs are done, fill half of the tortilla with eggs. Fold tortilla over and serve right away! 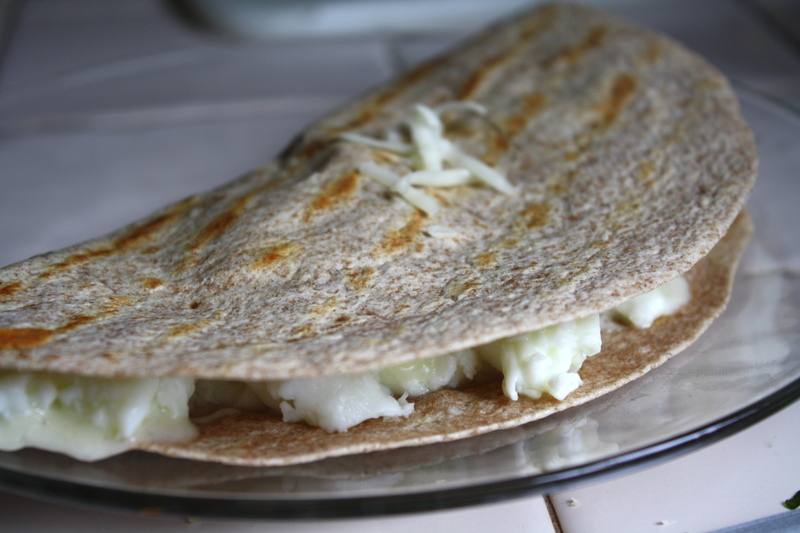 This entry was posted in breakfast, cheese, vegetarian and tagged breakfast, easy, egg white, quesadilla by Laura Zolnoski. Bookmark the permalink. What a creative twist! Sounds delicious! !